I love how with Google you can type in half a question, and see what via the “suggestions” what the most common related questions are. For example, if you type in “Why are radiators”, you will see that although many people want to know why radiators are black (or white), and many want to know why radiators make noise, the #1 thing that puzzles people about radiators is: Why are they under windows? It is indeed a good question. Maybe your radiators aren’t under your windows. But if you live in an older house, there’s a good chance they are. As a dramatic example, is the living room of my friends’ S. & J.’s previous home in Portland (used without permission, because it’s past their bedtime): If you said, “But those radiators are just pouring heat out the windows!”, you’d probably be right. So why put them there? 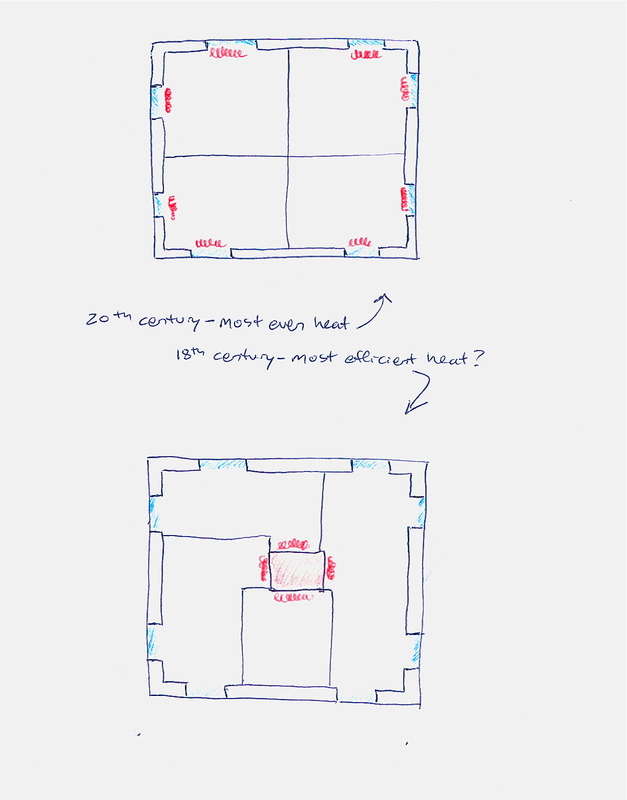 This is my hypothesis: central heating was new and exciting, and for the first time it was possible to design a house so that every room, and indeed every part of every room, was virtually the same temperature. I suspect people idealized a home where you could drift from cupboard to dining table to sofa to window-seat and not feel a “chill”. 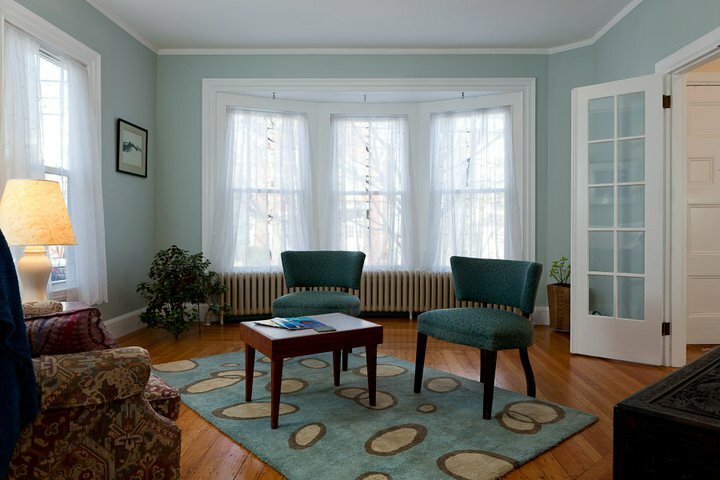 To achieve that, to really even out the heat, the best place to put the heat source was right in coldest place– which, before the days of weatherstripping and triple-glazing, was bound to be close to the windows. This worked out well with the advent of coal and oil heat. Until the 1970’s or so, fuel was relatively cheap and plentiful, and burning it was relatively easy. Efficiency and conservation do not seem to have been the watchwords of the day. But times have changed, and now people seem to be mystified by why their radiators are placed where they are. Some people want to fix the “mistake” of the original installer. Here’s a project someone posted for making these diverters to channel hot air away from a cold window: You might ask, then– why not relocate the radiators away from the exterior walls altogether? Why not move them to the walls closer to the center of the house? You’d sacrifice something in evenness of heat, but gain quite a bit of efficiency. Has anyone ever thought of this? So it seems that the move away from truly central central heating (to what I would call peripheral central heating) began as improved technology allowed for increased concessions to fashion and comfort. 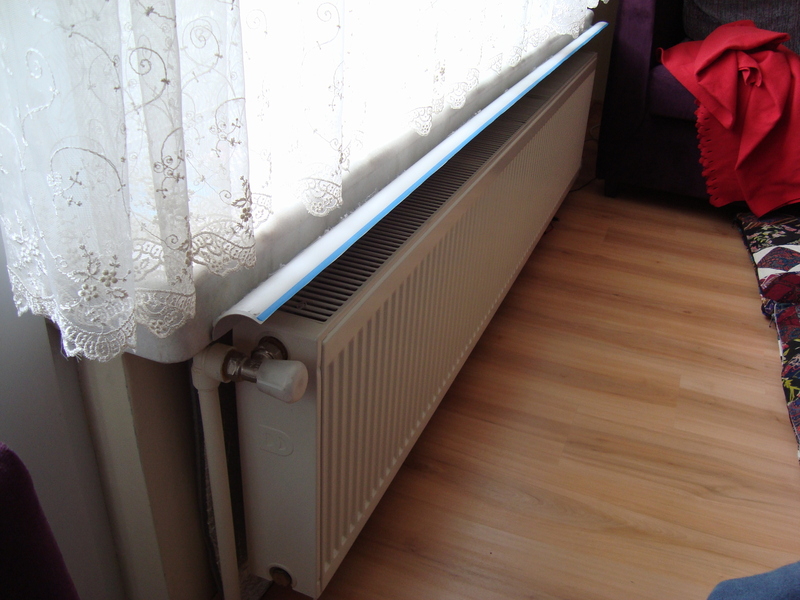 It is easy to see how house-end fireplaces could transition into under-window radiators. But now, as efficiency again becomes of interest, things might edge backwards. This entry was posted on November 15, 2011 at 9:24 pm and is filed under History, Stragegies. You can follow any responses to this entry through the RSS 2.0 feed. You can leave a response, or trackback from your own site. My parents’ current home is a central chimney design (self-built in the 1990s), and previous homes have had variations of that design. Germans (and northern Europeans generally) have a lot of masonry stoves, which, again, is the same idea. However! Now that I live in a radiator under (well sealed) windows design, I am comfortable at a good 3C cooler than in unevenly heated homes. Same applies to my previous forced air/drafty windows setup – needed much higher temperature to feel comfortable. Oh, I know, you’ll argue that you are comfortable with no heat at all and icicles on your nose are refreshing, but I have heard this argument – about peripheral (and in particular in-floor) radiant heat “feeling” warmer. 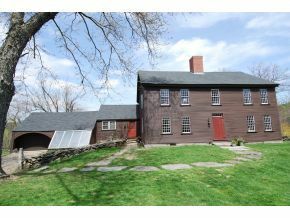 My childhood home (original section of the house built 1731) had a central chimney design that housed 5 fireplaces. To say that it created a warm zone is a bit of an understatement. I remember during the ice storm we actually closed off the “newer” (c. 1870) section of the house completely and moved into the older section because it was so much more heat efficient without electricity. 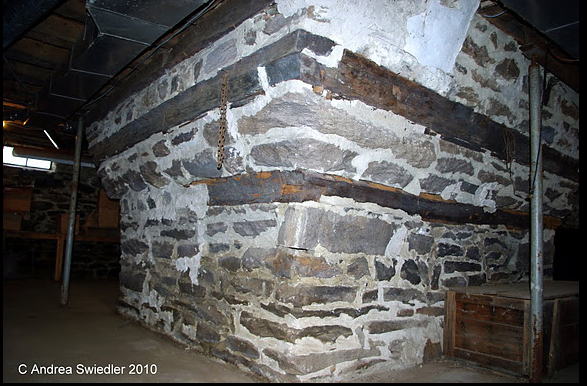 The picture of the CT house chimney in the basement reminds me if ours. The base of ours must have been close to 10′ wide by 8′ deep of solid brick. Terrific post. Many thanks, and for the links. My circa 1850 house has been remodeled — “remuddled” the “Old House Journal” would say — too much on the inside to be really clear about how it was originally built, but there does seem to have been a central chimney, though not anywhere close to as massive as the one in those fabuloux pix. As for radiators, the wonderful big cast-iron ones in my family home, which was built just around the turn of the last century, weren’t under the windows, but tucked away in the corners of rooms. 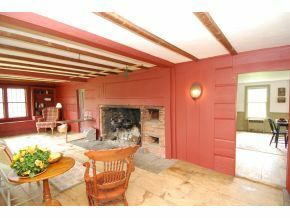 I suspect that’s because the house was originally built as a vacation home a few miles outside of Boston, and had a wonderful abundance of huge wide windows, bay windows in almost every room, and wasn’t originally intended to be occupied during winter. So the central heating and the radiators were for mitigating any slight chills during spring and fall, not for coping with mid-winter in New England. In any case, I loved those radiators, but have since found that the heat of a good woodstove is even nicer and more gently warming. Really interesting post about something I never really thought about before. Thanks! Secondly, they (were designed to) fit there and don’t take up valuable interior wall cabinet / cupboard space. A few years ago we stayed in a newly built & custom designed super insulated home in Scandinavia; where they have very strict insulation and performance guidelines for new construction (mandated minimum performance standards, unlike the US); and it had wall-mounted thin electric heaters located under the triple pane windows. So, I think there still is something to heating the biggest point of heat loss and the convection loop. Note: I’m not a heating pro and could be entirely wrong with my view on the subject. I second the comment about this being a terrific post. Very interesting. Thanks. The outer walls and windows in particular are the coldest. Cold air ‘spills down’ toward the floor from these surfaces because it is denser. The cold air will pour through the fins on the radiator. The hot air from the radiator is rising toward the ceiling because it is less dense. This combination creates a lot of air movement through convection and helps mix the air so it doesn’t stratify in the room… cold air on the floor and hot air at the ceiling. 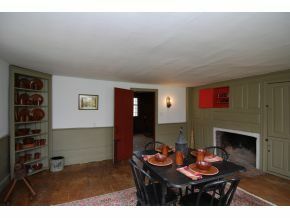 The warmed, mixed perimeter air sums together in the center of the house to create an even temperature throughout. Again, it’s just speculation on why radiators and vents are on the outside. Yes, that definitely seems to be part of the strategy as well. It’s all about even heat. Which, honestly, I think is over-rated. I rather enjoy being able to move closer to the stove when I’m cold– and away from it when I’m too warm! This year I started my own cold house adventure and I found your journal as a result. This weekend I was watching the Anne of Green Gables movie on PBS. Anne and her friend Diana held a race to see who would be the first to reach “the warm side of the bed”. 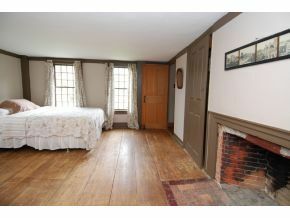 I assume this means the side closest to the fireplace. If I relate that to the common differences between men and women when it comes to temperature, having a cold side of the bed and a warm side works out just fine. Another point scored for uneven heat! Agree with you entirely, Cold House. But reading the posts on Hearth.com by nervous prospective new woodstove owners, it seems to be a major issue for an awful lot of people. Most of the posters there are men, and they generally blame it on “the wives.” I suspect women generally are more bothered by temperature differences, maybe physiologically so. No idea why I escaped.